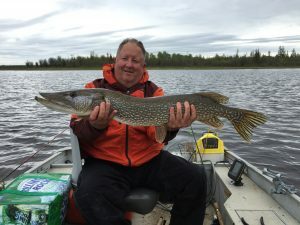 Kabinakagami Lake provides the ultimate in wilderness fishing. You can catch your limit most days right off the dock but you have 30 miles of lake to explore as well. Walleyes abound and are easily located, providing fast action and a tasty shore lunch at mid-day. Great Northern Pike prowl these waters, and many in the 20 lb. class are caught each season. Jumbo Perch also reside here and quite a few guests target them with worms, minnows, or small spinners. Kabinakagami Lake is also great for fly fishing as the average depth is only 15 ft. A moderate sink tip 8 wt. line is sufficient in most cases. The Lund 16 Ft. Stalker boats, and 25 HP electric start motors whisk you around the lake in style and comfort, and let you concentrate on the important things…like fishing!!! Once you fish with Agich’s you’ll be spoiled for life. In the Spring look for Walleyes in 10 Ft. of water or less. Often near inlets or areas of current. Island saddles and windblown points also are good bets. jigs, tipped with plastics, minnows, or crawlers produce best. Rapala style baits are also effective. It is not uncommon to catch 100 fish in a day under the right conditions. As Summer progresses the fish start moving deeper. Look for Walleyes on classic deep water structure and rocky areas. However don’t overlook the weeds as many Walleyes setup shop there. Spinners, jigs, Crankbaits, and Spoons will all produce Walleye at this time of year. Live bait is productive year round. Fly fishermen will benefit from a fast sink tip, and Bunny Leech combo during the Summer months. 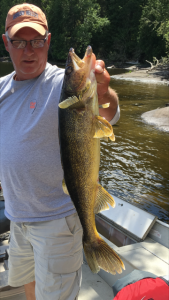 12-15 ft. of water is where you will find many Walleye in Summer. 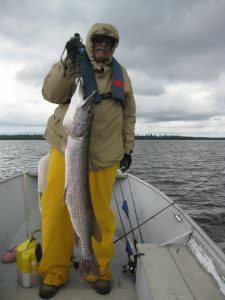 Pike will be shallow in the early Spring and the back end of bays and quiet shorelines will produce. Typical lures are spoons, spinners, or live bait. This is a great time to find large, hungry Northerns and steel leaders are a must on Kabinakagami. For fly-fishing, bunny strip leeches and Clousers work well. An 8 Wt. setup with a moderate sink tip will fit the bill. Strip the lures in through shallow cover and hang on! In Summer Northern Pike begin looking to defined weed edges, drop offs, and deeper water as the summer wears on. Fast moving spinners, spoons, and crankbaits all produce. Trolling will help to cover more water and keep your baits in the strike zone continuously. 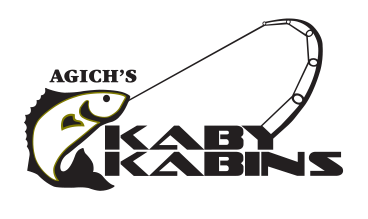 Fly fishing methods produce year round, as Kaby remains a “cool water” environment even during the “dog days” of August. Perch can be found year round near reedy shorelines or anywhere there is sufficient cover. Small gold spinners tipped with worms or small spoons work best. Drifting covers more water and doesn’t spook the fish. 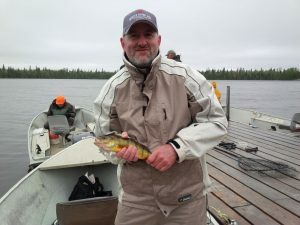 The Perch you will catch in Kaby Lake are usually large, 10-14 inches is the norm. Whitefish are a blast to catch on fly tackle or light spinning gear. You will often see them dimpling the surface morning and evenings, sipping shad flies from the surface. These fish are strong fighters and make great table fare. Try worms, minnows, small spoons, or Mayfly imitations for best results. Start planning your fishing trip of a lifetime today. Please note that prior to arriving at our lodge you will need to purchase an Ontario fishing license. Licenses can be purchased at numerous sport shops and stores along HWY 17, en-route to White River Ontario which is where the airbase is located. For a list of items to bring with you please take a look at the location page.